Miss Teen Trinity-Conception Pageant Website! Thank you to Sarah Legge for being a great ambassador for our organization and an amazing titleholder for the Miss Teen Trinity-Conception Pageant. It was a pleasure working with you. 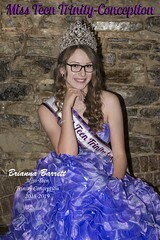 To Book Miss Teen Trinity-Conception At Your Event, Please Click Book Appearance From The Business Navigation Menu. To Become A Sponsor, Please Click Become A Sponsor From The Business Navigation Menu. Please Feel Free To Browse The Website Or Use Our Convenient Search Tool To Navigate Our Site.